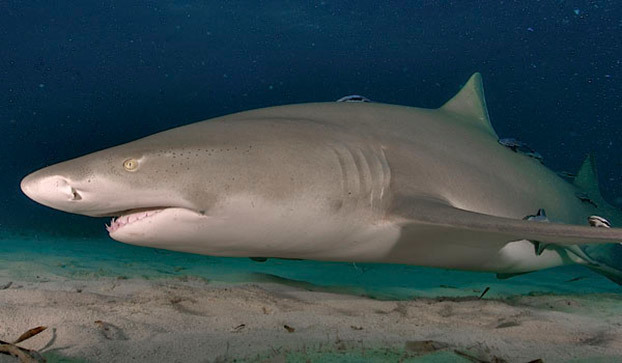 Overview — Lemon sharks may dive up to 1,300 feet when searching for food, but usually they are found near shore areas at depths closer to 295 feet. Their unusual coloration sets them apart from most other sharks. "Lemon" refers to their light brown, yellow-tinged skin. It provides good camouflage for the sharks, which like to rest over the sandy bottoms of shallow water regions. From a distance, it is hard to tell where the sand ends and the shark begins. One clue might be the presence of small reef fishes, such as wrasses, which gather around this shark to pick off parasites from its gills and skin. This species is most commonly found in the Caribbean, but it also exists in the western and eastern Atlantic and eastern Pacific from southern Baja California to Ecuador. Feeding Behavior — Lemon sharks may chase down other sharks as prey, along with large sea birds, squid, crustaceans, stingrays and eagle rays. This is not an aggressive shark species toward humans; however, when threatened, this big yellow fish will not hesitate to inflict a potentially serious, and even deadly, bite. Cool Fact — Its scientific name means "the shark with the smooth teeth and the short snout." Common Max Depth — 295 feet, while some may dive to 1,300 feet.